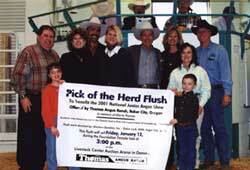 Thomas Angus Ranch, Baker City, Ore., donated a pick of their herd flush in memory of Gloria Thomas, the matriarch of the Thomas family, to the 2001 National Junior Angus Show (NJAS). The flush sold January 12 at the 2001 National Western Stock Show in Denver, Colo., to Paws Up Angus, Dave and Nadine Lipson, of Greenough, Mont., for $15,500. The Thomas family decided to offer the runner-up bidder the same package. Kahn Cattle Company, Rydal, Ga., purchased the second package for $15,000. All proceeds will go toward the 2001 NJAS that will be July 10-14 in Denver, Colo., and is being hosted by several western states. The Thomas family guarantees 10 implantable eggs. The work to process the flush is being donated by Western Genetics, Inc., Galen Lusk, DVM, Sugar City, Idaho. Pictured from left includes Dave and Nadine Lipson, Paws Up Angus, Greenough, Mont. ; Rob, Lori and Bob Thomas, Baker City, Ore.; Tari Hoagland and Carla Malson, co-chairwomen of the 2001 NJAS; and Jim Raines, Kahn Cattle Company, Rydal, Ga. Michelle and Matthew Malson, Parma, Idaho, are holding the banner. Copyright © 2000 Angus Productions, Inc. All rights reserved.